Mobile, mobile and mobile…. To be honest, this is the future and a major portion of internet traffic is coming from mobile devices. 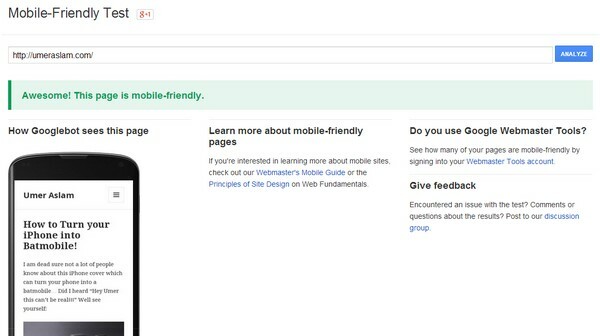 It is a no-brainier that now Google is also encouraging the webmasters to make their websites mobile-friendly. Recently, Google has also started showing mobile-friendly label in mobile SERPs which is an indication that Google is really serious about it. Recently, they have also introduced a Mobile-Friendly Test which scans your website and tells if it is compatible with mobile devices or not. Enter your website url in the space provided and press “Analyze”. It will take anywhere from 4-5 seconds to up to 20 seconds. If your site is mobile friendly, you will see this message: “Awesome! This page is mobile-friendly.” You will also be able to see a preview of your site on mobile. If you are using WordPress, then it is really easy to find a free responsive theme. Make sure you convert your non-responsive website into a responsive one because Google is really serious about this matter. In case your website is still not mobile-friendly, it will loose its natural rankings in mobile serps. Besides this test by Google, there is also another tool made by W3C . You can check it out at: http://validator.w3.org/mobile/. It takes a little more time as compared to Google but will provide a very comprehensive reports on errors.